Fig.1 illustrates the pyramid of the basic components of a person. Presented is the developmental equilibrium between all three terrestrial(!) components of a person. 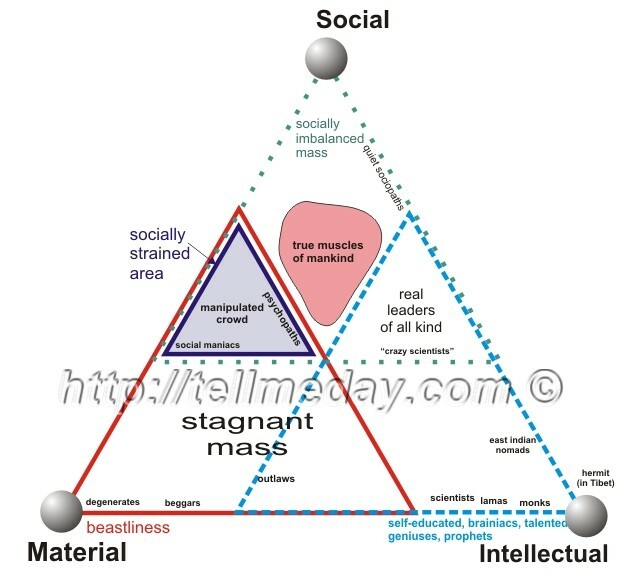 In the basis of a pyramid lies an equiangular triangle consisting of three spheres: Material, Social and Intellectual. An aforementioned article describes in detail the internal structure of each of the spheres. For better understanding of this model we will take into consideration principles of analyzing of an abstract person. The point, lying at the center of the opposite section is the beginning (0%) of the vector, representing respective human life activity. Thus, in an ideal scheme, the person should represent a harmonious combination of three components that leads to 33.3% on each scale. Of course, in real life the parity of contributions of each component of the triangular matrix is not ideal, as it would vary for each individual person. However, considering the large size of the human population, the accumulated experience of previous generations, it is possible to make generalizations and apply them to organizing separate individuals into precisely determined groups with corresponding characteristics and properties. Due to the fact that each sphere consists of countless internal aspects, the problem consists in effectively estimating the final value of each vector based on a 10 (or 100) point scale. Upon getting the final figures it becomes easy to calculate the "coordinates" of an individual in the general triangular matrix. For example, if the individual gets 45 points on the material scale, 30 points on the intellectual, and 10 points on the social scale, further calculations involve bringing the total sum of points to 100 and calculating the percentage of each factor’s contribution to the grand sum total. Following through with the aforementioned numbers we get 85 points (45+30+10) = 100%. 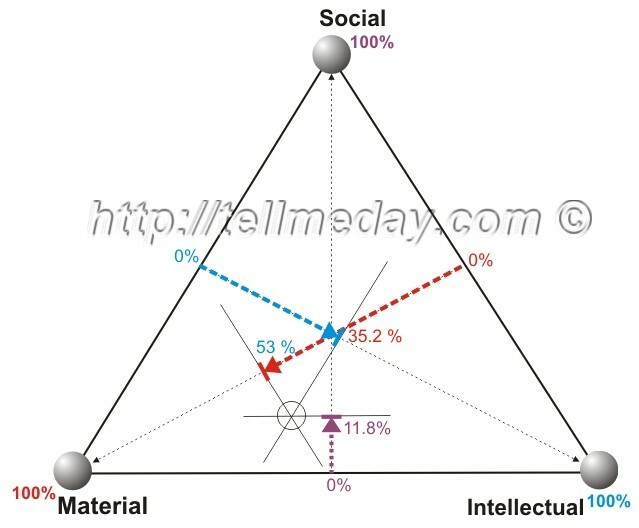 For example, the material sphere accounts for 53% of the triangle, the intellectual for 35.2%, and the social for 11.8%. There are several traditional stereotypes or misconceptions of how human envisions the position in real life. For example, the stereotype of "contempt" for material possessions in life is quite a popular one. People who hold this view have accepted to despise riches, wealth, and tend to deny the importance and quality of private life, beginning with person hygiene and ending with living conditions. In order to more clearly imagine the abstract representation of this category of people, one can observe an extreme of such category, namely a homeless beggar. But, even in such a case nature prevails, as this individual still has to eat and sleep. They do not prefer leftovers and donations to well-cooked cuisine, and still look for warm ventilated areas to sleep at night. We call such actions hypocrisy in relation to ourselves; as such people for some reason consider that the society owes something to them. It can be excused in rare cases when they have significant mental or physical disorder. We will not discuss in detail other banal and rather obvious faults such as excessive love for money, to riches, to authority over others and to ourselves, succumbing to one’s own weaknesses, or abuse of the physical body. Instead, we shall simply plot all the important general components, aspects and zones on the diagram. The purpose of the given scheme (Fig.3) is the designation of possible zones in finding the human essence during the course of its development or degradation. Is there a light at the end of the tunnel? Will we find equilibrium for the body, mind and soul of a person on the presented diagram? Obviously, the averaging effect of the overwhelming majority of the world’s population is going to position this point towards the middle of the triangle. In general, the majority of people are mentally stable, make rational decisions, possess a so-called “common sense”, adapt to their environments in order to suit their needs, set goals for themselves and methodically work at reaching those goals. In is a paradox that on the one hand these people strive to reach the SupeEgo, and on the other – are under constant and strong influence of this SuperEgo. The inner workings of this zone are quite intricate, but it is possible to single out its two general areas: area of stagnant (say) «adequatees» and area of inertial «adequatees»*. The following examples will clear up the meanings of these areas. When the masses hear a warning about an upcoming natural disaster, the voice of reason tells them to seek shelter in a safe area as to save their lives and protect their belongings before the event, say a hurricane, reaches them. Thus, it is possible to use simple mental influences in order to dislocate huge numbers of people. However it is impossible to rely unequivocally on such explanation and behavioural characteristics, because in other situations a significant part of these same individuals can act completely different. They can in fact prove to act as a rather inert essence that refuses to change or shift their opinions and sticks to settled principles. This explains riots, where individuals forget rational reasoning, and in turn act as a single mindless entity that imitates and exacerbates its own actions. These actions result in riots with people marauding, breaking shop windows, and looting. As you know, and at times and observe, NOT ALL people engage in these "infectious" actions. Also any person will agree, that in (it would seem, the realized actions) demonstrations and demonstrations people, but only the certain percent of people take part NOT ALL. Just as NOT ALL people choose to show up at rallies and riots and engage in crowd mentality, only a percentage of the population engages in such activities. Thus, it is possible to say that the majority of people can be positioned in the central zone of the diagram, which can be conditionally divided into subzones: the so-called, «manipulated crowd», as well as the «true muscles of mankind» that do not succumb easily to the control and manipulation of others. Of course, these two subzones cannot be perfectly separated, and thus, many overlaps exist between them. You can draw your own conclusions about yourself once you find your point of localization on the diagram, following the offered scheme of reasoning. 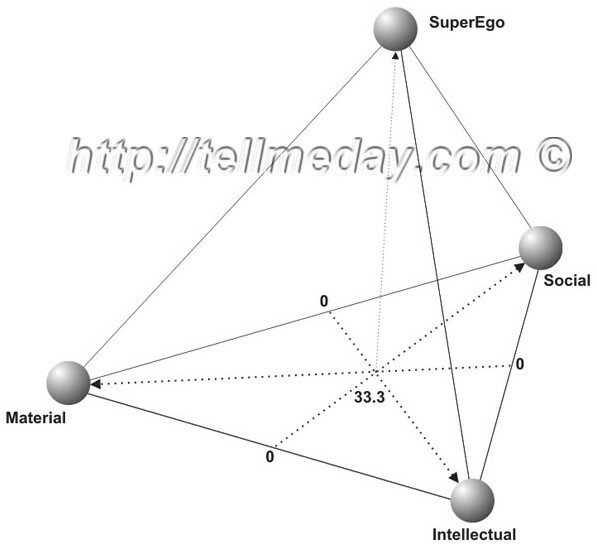 You see everything in the top of this tetrahedron of the «SuperEgo» of a person. It is the final destination of the purpose of human life. All meaning of life of a person consists in the ability to more quickly to reach the channels that lead to the “SuperEgo”. The shortest way from a point in the pyramid up to the surface is perpendicularly down from the top. The further you are from a point of crossing of the three components that make up your terrestrial essences – the more difficult it is for your «SuperEgo» to relay to you the meaning of your existence, to prompt the correct decision in difficult situations, to fill your life with radiant energy and true happiness. Many know and have their own beliefs about the so-called “internal voice” or “intuition”, however, not many actively use it. * «adequatee» – means the person with easily predicted behaviour and reaction.